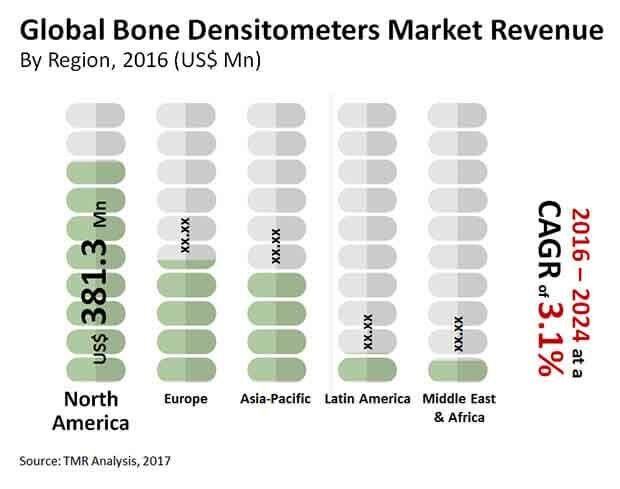 The global market for bone densitometers was valued at US$0.84 bn in 2015 and is expected to escalate to a value of US$1.11 bn by the end of 2024. The CAGR of the global market for bone densitometers over the period between 2016 and 2024 is estimated to be 3.10%. Based on end-use, the global market for bone densitometers has reaped the highest revenues through hospitals. Geographically, the immaculate disposition of the healthcare industry in North America has facilitated growth of the regional market. Bone densitometers are used to measure the density of bones by means of an X-ray, and is used in the detection of diseases such osteoporosis or osteopenia. Low boen density is a sign of weak bones, and it is extremely essential to treat such a condition to avoid fractures or bone dislodgements. In recent times, the incidence of osteoporosis has risen due to the changing lifestyles and eating habits of the masses This has given an impetus to the growth of the global market for bone densitometers. The review is based on TMR’s report titled “Bone Densitometers Market (Technology - Axial Bone Densitometry (Dual Energy X-Ray Absorptiometry and Quantitative Computed Tomography) and Peripheral Bone Densitometry (Single Energy X-Ray Absorptiometry, Peripheral Dual Energy X-Ray Absorptiometry, Radiographic Absorptiometry, Quantitative Ultrasound, and Peripheral Quantitative Computed Tomography); End User - Hospitals, Diagnostic Centers, and Specialty Clinics) - Global Industry Analysis, Size, Share, Growth, Trends, and Forecast 2016 – 2024”.